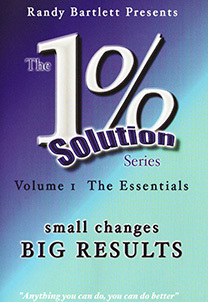 The 1% Solution Volume 1 - The Essentials By Randy Bartlett The 1% Solution Series was produced for both the experienced Mobile Entertainer as well as mobile DJs at the start of their careers. The concept is simple-very small, easy to implement changes which will result in a vastly improved performance. The series is filled with real life examples of performance enhancing techniques which can be used by all levels of performers. These are the techniques which will allow you to generate more direct referral business, resulting in more demand for your services, and giving you the ability to command a higher fee while reducing your advertising costs.